The broom has swept clean at Spetsstroy. RIA Novosti indicated Khodos had been ex-Spetsstroy Chief Abroskin’s Chief Engineer. 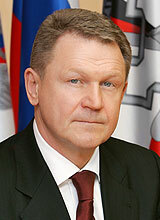 Bogomolov was his Deputy for Construction of Special Designation Facilities. And Mirzoyev was Deputy for Capital Construction and Industry. Specific duties for Onilov and Gulakov weren’t cited. Other Russian media noted they followed others forced out before Abroskin was retired. Some accounts claimed they were connected to construction of “Putin’s palace” on the Black Sea. In any event, ex-Deputy Defense Minister, now Spetsstroy Chief Grigoriy Naginskiy has wasted no time in getting a clean slate. And it’s pretty rare that the wheels of the cadre machinery turn rapidly. The whole operation must have been in the works for some time. The dust’s settled a bit on this story . . . in a 22 April decree, President Medvedev replaced Nikolay Abroskin as Director of the Federal Agency for Special Construction (Spetsstroy), putting Deputy Defense Minister Grigoriy Naginskiy in Abroskin’s place. What does the change at the top of this large, government-financed construction firm — nominally under Defense Ministry control — indicate? Ending Abroskin’s 13-year tenure in the Spetsstroy empire took four years. According to Kompromat.ru, Defense Minister Serdyukov’s wanted Abroskin out from beginning, but, unlike in other personnel situations, it took him a while to win out. The media says the anti-Abroskin operation was methodical. On his 60th birthday, four-star Army General Abroskin was dismissed from the Armed Forces, but left in his civilianized post. This created the convenient precedent to have another civilian succeed him. Then Medvedev dismissed Abroskin’s long-time deputies and allies. According to Kommersant, Spetsstroy’s annual collegium in late March was a solemn affair, devoted mainly to talk about order, discipline, and anticorruption efforts. But the Main Military Prosecutor wouldn’t tell Kommersant whether it was investigating Abroskin or anyone else at Spetsstroy. Then the final stroke on Abroskin came three weeks later. Spetsstroy’s a semi-militarized agency with ranks and, until this spring, conscripts, under formal Defense Ministry control, but traditionally and generally acting as an independent federal agency. As its name suggests, Spetsstroy is responsible for special government construction projects – in the Soviet and Russian past, it built secret industrial, defense, and specialized facilities, but has also built more mundane military housing, bases, garrisons, road, and electrical power projects. It also builds major state infrastructure like hydroelectric stations, dams, and bridges. 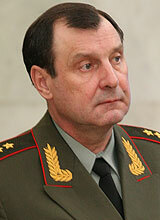 Most of Spetsstroy’s work is no longer for the Defense Ministry. Kommersant says only 26 percent of its 2010 work was for the Defense Ministry. A Defense Ministry official told Vedomosti the territorial divisions of Spetsstroy, in particular, work essentially like private construction firms and contractors. Kompromat put its 2009 revenue at 67.7 billion rubles, making it a large company, even a market leader, by Russian standards. Its most recent controversy revolves around the alleged “Putin palace” on the Black Sea. According to Newsru.com and other media outlets, Spetsstroy is building a billion-dollar residence for Prime Minister Putin’s personal use. The money for the elaborate Italianate mansion allegedly came from Putin’s rich business cronies. Now about Naginskiy . . . you remember his arrival at the Defense Ministry in early 2010 to be Serdyukov’s deputy for housing and construction. The 52-year-old Piter native’s a construction magnate who got rich renovating nuclear power plants, and then entered politics. He joined United Russia in 2002, and served in the Leningrad Oblast assembly before representing his region in the Federation Council. According to Forbes, he’s the richest official in the Defense Ministry, but he’s only 45th on the list of millionaires in government service. His family income was over 100 million rubles in 2009. 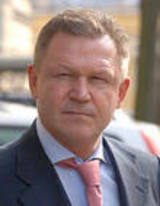 Finans places him as the 163rd richest Russian. Recall also that Naginskiy went without portfolio starting in mid-2010, and his colleague Deputy Minister Shevtsova found housing in her lap. All the good journalistic coverage of the Spetsstroy story agrees on one, well two, things. Getting rid of Abroskin was all about controlling an agency that was too independent and, more importantly, controlling its money. As Kompromat concludes, it’s natural for Serdyukov to want his man to have his hands on these large “financial flows.” Kompromat suggested Serdyukov may have also had his eye on selling some of Spetsstroy’s expensive Moscow real estate. But this isn’t all there is to the story . . .
Argumenty makes the point that Serdyukov has holes in his top management team. Six months without a main finance officer has left the Defense Ministry behind on placing armaments contracts (again threatening a bad year for GOZ fulfillment). And now Serdyukov’s lost First Deputy Defense Minister Popovkin to Roskosmos. Popovkin’s replacement will be a huge story. Even if Shevtsova has the housing issue, Serdyukov absolutely has to replace Chistova and Popovkin. And Nezavisimaya gazeta suggests Serdyukov will soon appoint a new deputy primarily responsible for establishing aerospace defense (VKO). Ruslan Pukhov tells Vedomosti the whole situation proves Serdyukov still has carte blanche from the country’s leadership, and NG claims Serdyukov’s political position has never been stronger. Kommersant makes a point of saying that Abroskin doesn’t appear on the list of Russia’s richest bureaucrats, suggesting of course that this career serviceman might have amassed a fortune, but can’t report it because it was obtained through graft. Perhaps the paper’s larger point is that appointing a wealthy executive from a private firm is the only chance for avoiding corruption in a high-level post. Or who will answer for what? On Tuesday, Kommersant and Rossiyskaya gazeta described, even if they can’t explain, Deputy Defense Minister portfolio changes. The shuffling began in early July, when Grigoriy Naginskiy was ‘freed’ from his responsibilities as Chief of Housing and Construction but remained a Deputy Defense Minister. According to a decree known, but not published, Medvedev removed General-Colonel Dmitriy Bulgakov from his post as Chief of Rear Services, while retaining him as a Deputy Defense Minister without specific duties. It’s widely believed, of course, Bulgakov has taken charge of a new Material-Technical Support (MTO) empire that will encompass not only logistics but also arms and equipment supplies. For his part, Defense Ministry Apparatus Chief Mikhail Mokretsov formally became a Deputy Defense Minister (no longer holding just informal ‘Deputy Minister status’). Kommersant points out there are still eight Deputy Ministers (six are civilians). A Defense Ministry source told the paper, however, that Bulgakov might be civilianized. And his MTO organization will be part of the Defense Ministry’s ‘civilian component’ as opposed to its ‘military component.’ Kommersant says the ‘military component’ (planning and operational troop command and control) will just be the General Staff when the current Defense Ministry reorganization is complete. Bulgakov has apparently indicated that MTO will have a planning and coordination department, a resource and transportation support department, Main Automotive-Armor Directorate (GABTU), and also repair-refurbishment and metrological directorates. As announced elsewhere, ten new MTO brigades are to be established in the four new OSKs. Recall that, in the same presidential decree on Naginskiy, Bulgakov’s rear services chief of staff Sergey Zhirov became Chief of the Planning and Coordination Department (read staff). Mokretsov’s bio has a note that he added Deputy Defense Minister to his title in July. The ultimate plan behind these moves isn’t clear yet. But it does seem to go back to late June’s replacement of Kolmakov with Popovkin in one of the Defense Ministry’s two First Deputy slots. More support functions were and are being consolidated under civilians, while purely military training, planning, and operations may now be more solidly under General Staff Chief, First Deputy Defense Minister Nikolay Makarov. Bulgakov Adds More to His Portfolio? In addition to his new title Deputy Defense Minister for Material-Technical Support and his responsibility for arms and equipment supplies, General-Colonel Dmitriy Bulgakov has apparently also picked up Grigoriy Naginskiy’s duties as Chief of Housing and Construction. Bulgakov accompanied Prime Minister Putin on a tour of military apartments under construction in Volgograd today. The contractor told Putin the land was acquired three years ago, but delays in installing utilities held up construction until this year. They also complicated the process and added 5,000 rubles to the per-square-meter cost of the apartments. Bulgakov was quoted saying the first batch of apartments in the new mikrorayon for servicemen (739 apartments) will be turned over in December. He also said 1,978 servicemen need housing in the city. This morning’s press reported (with varying degrees of accuracy) that the Chief of Housing and Construction, Deputy Defense Minister Grigoriy Naginskiy has been ‘freed’ from his principal duties, but remains a Deputy Defense Minister. See Kremlin.ru for the text of President Medvedev’s decree. The midst of a year of trying to deliver on huge permanent military housing promises seems an odd time to make yet another change of housing chief. These could be the opening moves in Defense Minister Serdyukov’s reported effort to establish a unified material support establishment responsible for arms, equipment, and all logistics. In Monday’s Nezavisimaya gazeta, Vladimir Mukhin described a 15 May demonstration outside the Defense Ministry by former officers who were allocated ‘virtual’ apartments in Balashikha six months ago, but have been unable to occupy them due to slow paperwork. Their demands are simple: these retirees want bureaucratic obstacles removed. The protest was not covered by the media, or received only scant coverage. However, the Defense Ministry’s promise to fix the problems for former servicemen from Balashikha was reported widely in the press. Mukhin’s subtitle for the article reads, “Unfulfilled Presidential housing program for the military leading to protest actions.” He concludes that military demonstrations have been so rare in post-Soviet history that, if they occur, they have to be symptomatic of something. He says similar protests have happened in other regions with large military garrisons. Everyone remembers Defense Minister Serdyukov’s reports about fulfilling the military housing program in 2009. However, it’s becoming clear that this didn’t happen. New military housing and construction chief Grigoriy Naginskiy not long ago announced that of 45,000 permanent apartments handed out in 2009, less than half have been occupied. So the plan wasn’t achieved. This has provoked a protest mood in the army, and the authorities, it seems, prefer not to notice it. Mukhin cites similar situations and actions in Bashkiriya, and elsewhere in Moscow’s far suburbs. The All-Russian Professional Union of Servicemen (OPSV or ОПСВ) tells Mukhin it’s pretty simple. A garrison is drawn down, and officers who don’t want to relocate are put out of their apartments (sometimes into the street). The garrison is then sold by Defense Ministry officials with a direct interest in this. Mukhin concludes, that’s the ‘new profile’ army for you. OPSV Chairman Oleg Shvedkov told Mukhin several thousand retired officers and servicemen participated in May 1 protests around the country. They protested not just housing, but also pension and pay problems. But, of course, active-duty servicemen are prohibited from participating in political actions under the law. 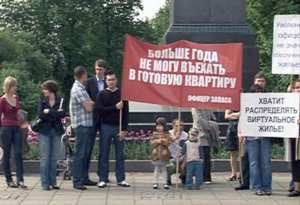 Viktor Baranets also addressed the plight of former officers in Balashikha in a 12 May article. According to ITAR-TASS and RIA Novosti, a Defense Ministry housing official promised on 15 May that the problem of 80 retired servicemen and the apartments allocated to them in Balashikha would be resolved before the end of June. He said the process of preparing all the necessary documents would be complete by that time. A Defense Ministry spokesman said a meeting with an ‘initiative group’ [i.e. the protesters] was held in the ministry. He also indicated the Defense Ministry is trying to speed up and smooth out the process of preparing and registering survey and property ownership documents.